London’s got its very own comics festival, and it’s kicking off this weekend. But don’t let yourself envisage flocks of overgrown adolescents in ill-fitting capes – Comica’s appeal is that it casts its eye more broadly, bringing in arresting art and affecting stories from around the world. Normally it’s the heroes in tights hogging the spotlight. Comica gets them to step aside for a couple of weeks a year in favour of the unusual and the unsung. Hey – it’s like they’ve revealed comics’ secret identity. Jeffery Lewis, Saturday 20th – The singer/songwriter and comic book artist will be playing an hour-long afternoon show before settling in for a conversation. The only other London date for this New York anti-folkie is sold out, so this live acoustic set is a bonus chance to hear him sing a good song about getting beaten up by Will Oldham on the subway. At £6 we reckon this one’s a deal. Make Mine Manga, Sunday 21st – Manga artists hook up with an editor to shed some light on what makes Japanese comics the inspirational force they are. Top tip: come early and use your ticket to get free admission to the finale of the 24-Hour Comics Day. 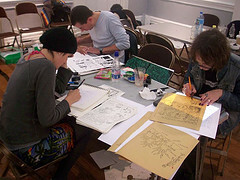 Artists all over the world will have been slaving to create comic books in only a day, so slip in to see the unveiling. Illustrated London Noise / London Lip, Friday 26th – Punters face a tough choice on the first Friday. Pop along to the ICA for a musical evening of comics-inspired vinyl eclecticism, or head into the City to see comics legends Alan Moore and Michael Moorcock? They’re talking about their work in Iain Sinclair’s sprawling book on the capital, London: City of Disappearances. Difficult, but if you’re leaning towards the bearded Northerner be forewarned – there aren’t many tickets left. Comica, 20th October – 6th November, ICA and various venues. For more information go to the Comica website here. Image taken from surprise truck's Flickr photostream.